The creativity and performance within New Orleans’ music scene has always thrived. Indeed, musical influencers have created some of the city’s most iconic sounds in and outside of the Big Easy. A crucial aspect of the city’s vibrant music scene is the ability for anyone to hear free music, as long as they step onto the right block. In recent years, the city has become home to large, global music businesses like Live Nation and AEG which book show dates and organize festivals with some of the world’s largest artists. Yet, New Orleans is missing a well-established business aspect in its music scene. Major record labels, agents, performers, entertainment lawyers, and music publishers, and the subsequent networking world, all need improved support and monetary means in order to break out. Other cities like Nashville have proven that they can hold their own against major music hubs like New York City and Los Angeles. However, despite New Orleans’ global reputation as a hotbed of unique musical talent, it still has yet to breakthrough as a major locale for music production and its mainstream success. NOLA’s hospitality industry offers musicians an opportunity for employment at bars, restaurants, and hotels. The owner of Esplanade Studios, Mischa Kachkachishvili, told NOLA.com that musicians like John Legend, Common, and Willie Nelson have all recorded music in her St. Johns Bayou studio. However, she says that musicians are drawn to other cities because of their lively business scenes that can help support their music. She says that record labels will establish themselves in cities where there is a strong business that can support the everyday functions of publishing houses, networks, and industry players that make the music industry a success in those towns. Kachkachishvili mentions that when you have diverse businesses in a city, it can help support all aspects of a highly-functioning music industry that does more than just employs musicians to play two hours gigs, but also allows them to record, place their music, and plan their shows and tours. Although Kachkachishvili says the business scene can’t support a thriving New Orleans music industry, recent shifts may change that fact. The new 2017 Louisiana state law tax incentives and the prominence of new, locally-born bands who are enjoying both national and international success allows New Orleans music leaders to grow the local industry. Growth for the music industry won’t come cheap or easy. Reid Wick, the senior membership manager of the New Orleans for the Recording Academy and co-creator of the music industry studies program at Loyola University, says that music is one of the greatest natural and renewable resources, but that New Orleans has never fully invested in its capabilities on a larger scale. Many musicians had left New Orleans to pursue their musical dreams in other cities. PJ Morton, for example, left for Atlanta and began playing with India.Arie and Maroon 5. However, he later returned to New Orleans after the singer Solange Knowles drew attention back to the city after she recorded her hit album, A Seat at the Table, here. Solange embedded herself within the city’s cultural scene and appeared in Mardi Gras parades. As a result, musicians like Morton said they had to build their own music industry that represents them. While Morton is in a position to financially support his dreams, he says the city needs to be better about economically supporting artists. Recently, the city has bolstered its support of its hospitality and tourism industry, which brought in 10.45 million tourists in 2016. However, focus has remained on improving the gig economy for musicians. And, unfortunately, the annual Cultural Economy Snapchat factsheet from Mayor Mitch Landrieu’s office, the section only showcases how many opportunities musicians have to perform in the city. Many musicians realize that the profits in the music industry are made from songwriting and publishing, but being a live music town makes it difficult for artists. For example, Nashville became a success when country music went mainstream, but also because it had a close knit community of songwriters who worked with the musicians. New Orleans could be that next big music city if they can recreate that same type of collaboration amongst its creative artists. Currently, Erin Frankenheimer, an entertainment relations manager with Brooklyn-based indie music distribution company, Tunecore, is helping to increase communications across NOLA’s music business community via monthly music industry launches, which began in December 2017. These developments could become highly lucrative for the city. In addition, entertainment lawyers are now beginning to take up shop in New Orleans. Indeed, some say working in New Orleans is better because they get personable, facetime with their clients. But as business grows they can do more business for out-of-state bands too while growing the industry in New Orleans. Music management is also experiencing a second renaissance. Since starting in 2006, the management firm, MidCitizen Entertainment has steadily grown with local performers, managing the day-to-day operations of schedules, contact negotiations, promotions, other opportunities. One of its key players, Reid Martin, recently pitched the local darlings Tank and Bangas to a New York agency and they became a national break-out success. Many are seeing this as one reason to be excited about NOLA’s local music industry. The band sounds distinctly like they’re from New Orleans, but without the traditional jazz or funk styles. In 2017, they had won NPR’s Tiny Desk Concert. While streaming and pirated music has taken money streams from NOLA, it also makes it unnecessary to need to live in a major music hub like NYC or LA anymore. Plus, new incentives are arising for music creation in the city everyday. The Quality Music Company tax incentive provides music industry companies and with a minimum of three full-time employees at a 10% credit for each new job created with a payroll between $35,00 and $66,000. A 15% credit is given for jobs between $66,000 and $200,000. So far, the program has garnered $1.8 million in tax credits based on more than $7.2 million in Louisiana expenditures, reported in October 2017. Unfortunately, the peak tax credit consideration (at $1.6 million) has dropped to below $500,000 each year in the past three years. While no companies have yet taken advantage of the Quality Music Company incentive, time will tell if they do. While it may not help smaller businesses, it may help draw bigger companies and publishing houses with major hiring potential onto the local scene. From booking agencies to entertainment bankers and lawyers to handle entertainment and intellectual property law, New Orleans could be a hub of music-related success. 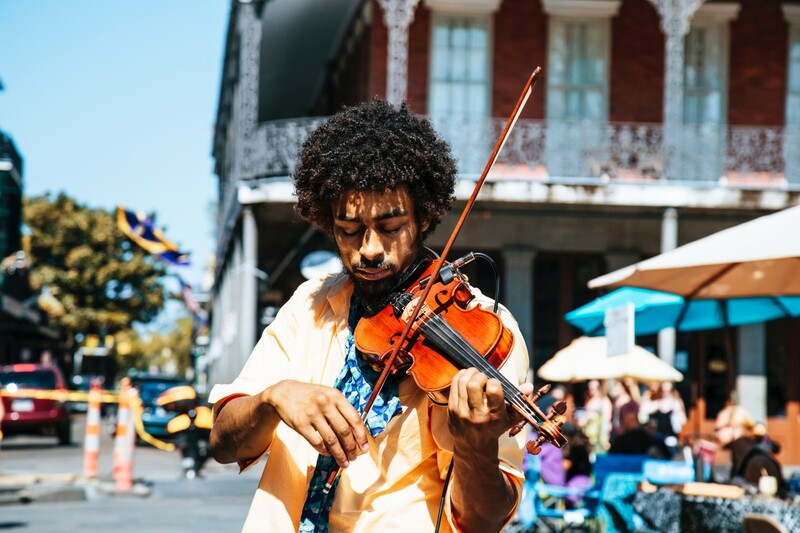 Although New Orleans has missed many opportunities to grow its music scene before, these initiatives and developments are paving new creative ingenues to regain the spotlight in a city whose rich musical history has always been a constant for the people who call NOLA home.